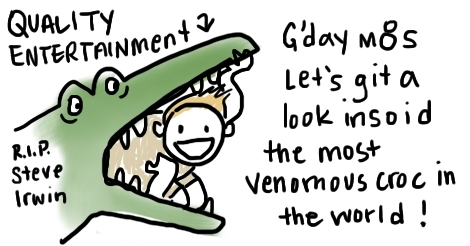 I am not even sure what the Australian stereotype is from the American viewpoint, exactly. They are farther away from us than outer space is, but they’re still here, somewhere on Earth. They have cavalier attitudes. Kinda leathery. I guess they are all rugged and outdoorsy? 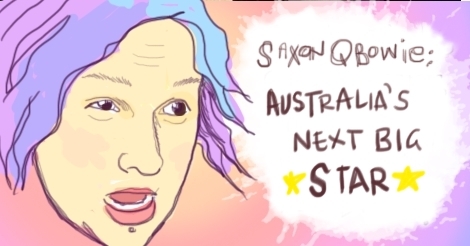 Especially our Australian writer, Saxon. So outdoorsy. And of course, everything in their land is trying to kill them, always, from every angle. They all survive, though, and some of them even become big name stars! I kind of think of the Australian super celebrity that makes it in Hollywood in a similar way that I think of all of our Secret Canadians. They aren’t tremendously obvious about it. There are so many actors that I look up, and they are like “born in Canada” and I point and shriek out an “ah ha!!! Another one!” I would do that to the Australian actors and actresses too, I guess, but they seem to be much more rare. But I am not here to discuss these YouTubes and my unique take on them — maybe I will on another day when I don’t have anything else to write about. Instead, today I am here to speak of my unique take of what little I know about the most famous and influential Australians that I could think of from off the top of my head without any research. There are not many. Probably shorter than I would expect. Or possibly much taller? A moody brooding creative type? I mean, for an Australian. One of the Olsen twins was involved with his death. 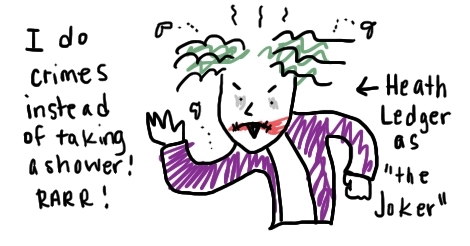 Oh right, he was the Joker that one time. I might be misspelling their surname. Helmsworth? One or more of them has been in a superhero movie. Are Australians particularly suited for superhero movies, or is it just because Hollywood makes twenty of those per year for the past twenty years? I could not recognize any of them out of a lineup of similar looking men. Battled Tom Cruise and defeated him. Eternal, ageless, possibly some sort of goddess or other immortal. Married to some country music guy of unknown nationality. Also an incredibly powerful, ageless entity. Was on a British soap opera? He was in Lethal Weapon movies and then also for a lot of history-based films. Kind of scary looking now. Known for his cantankerous, racist, misogynistic rants. I assume he’s no longer claimed by Australia, or any country for that matter. Started America’s first interest in Australia in the ’80s, which is the last time I watched it. People still use his silly little catch phrases. Portrayed by umm… Paul Hogan? Who is potentially not even Australian, for all I know. It could have all been an offensive Australian lampoon and none of us were the wiser. The most important crazy Australian nature guy who had no regard for his own safety but claimed to respect the animals he was throwing himself on top of, constantly. Over the top ridiculous accent. Now deceased. Death by an animal that he wasn’t even pestering. Seemed to be a nice guy, actually. Amazing real life swashbuckling biography. Went to trial about inappropriate behavior with some scandalously young ladies I think and got away with it all, of course. Also possibly Tasmanian. Or he was in his movie. I saw the movie, from the ’80s, for the first time like six years ago and can’t remember it. Cartoon wallaby from the early 1990s. Voiced by American, I believe. Seems potentially to be from New Zealand, but I think I remember it being established that he is from Australia. Going to have a movie out soon! !